Road Closure at Powhatan Wildlife Management AreaBeginning July 3rd, 2017 the lower end of Deer Lane (Route 662) on the Powhatan Wildlife Management Area will be closed to vehicular traffic until further notice due to vandalism and road conditions. The closed section includes the last quarter-mile of road continuing down to the boat landing at the Sunfish Pond. This section will remain open to foot traffic and non-motorized vehicles. The Sunfish Pond will remain open for fishing and carry-in watercraft use. Please refer to the Powhatan Ponds webpage for updates. 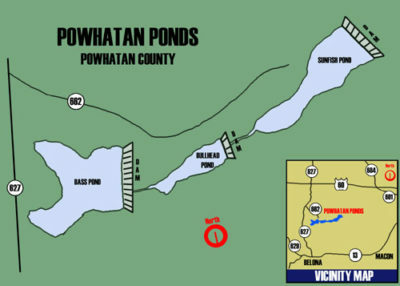 The Powhatan Ponds are three small ponds of nine, eight, and two acres respectively, located on the Powhatan Wildlife Management Area (WMA). The Bass and the Sunfish ponds contain largemouth bass, bluegill, crappie, redear, pumpkinseed sunfish, and catfish. They produce 6-8 inch redear and bluegill, and good numbers of 10-14 inch bass. Look for small crappie spawning along the dams in late April. The Catfish Pond is stocked annually with keeper size channel cats. All of these ponds are good spots to bring young anglers who like to have a lot of action. There is a dirt ramp at the upper and lower ponds for carry-in car tops and canoes. Only electric motors are allowed and these ponds are open 0.5 hour before sunrise until 11:00 p.m.